Did you spotted some lump formation over your skin? Has it increased over a few days? 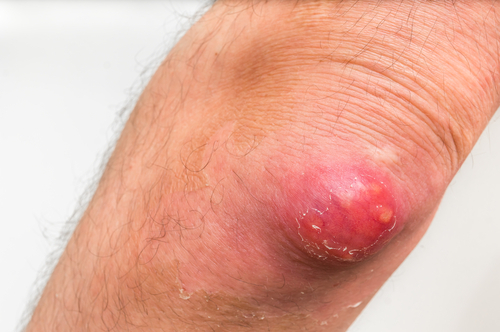 If it is followed by pus, then chances are you are dealing with carbuncle. At times, itching and presence of rashes can be confused with other problems like Scabies. But the difference is in the reason behind their occurrence. As far as scabies is concerned, it is due to mite infestation, and is highly contagious. It can be treated using a reliable OTC solution. However, if it is carbuncles, it develops when Staphylococcus aureus bacteria enter your hair follicles. The presence of scrapes and other broken skin make an easy path for bacteria to enter your body. And it can later result in boils or carbuncles filled with fluid and pus. What increases and decreases your risk of carbuncles? If you are already dealing with an existing health problem like diabetes, then you are more susceptible to such types of infections. Reason being, your immune system becomes weaker and any excessive friction can cause greater damage to the skin. Therefore, in order to reduce the risk you must use a good shaving lubricant and a natural antibacterial cleanser. If you want to go for something natural, a good natural antibacterial agent is Manuka Honey. For men, it is advised to use a facial fluid which consist witch hazel as an aftershave. Don’t go for those popular alcohol-based aftershaves which would else contribute to severe irritation and inflammation. The condition is not improving after two weeks. You are dealing with high temperature. Further, to promote healing you can apply a warm moist cloth to the affected area after some interval. Be very gentle and do not squeeze or try to cut it open. Doing so can lead to infection. Once it drains out, wash the area gently with warm water. Repeat this daily and pat the area dry. Make sure to apply a natural body lotion. Similar to other skin problems like scabies, even carbuncles are contagious. Yes, these too can spread through used clothing and bedding. Hence, ensure to wash each and every item in bleach to help kill the staph bacteria. Next, staph can live on the surfaces for several weeks. Thus, it becomes essential to clean them regularly with bleach, alcohol or an effusion of essential oils. Last but not the least, to strengthen your immune system, consider a good multi-nutritional supplement and an omega-3 fish oil supplement on a daily basis. Having a wide variety of natural anti-inflammatories, these serve to be immune system boosters. This entry was posted in skin disease, Skin problem, Warts, worse scabies. Bookmark the permalink.